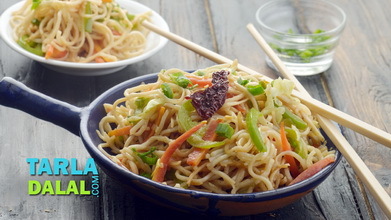 American Chopsuey represents the confluence of western and oriental cuisines, and when served with fried noodles, it is often considered an overseas adaptation of the popular Chinese dish, Chow Mein. 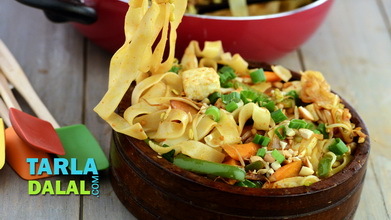 Chopsuey is essentially sautéed veggies flavoured with sauces and thickened with corn flour. 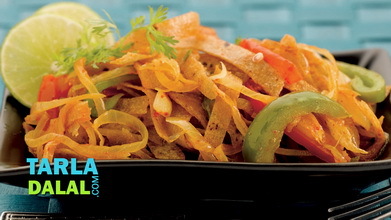 When served atop crisp-fried Hakka noodles, it makes a truly sumptuous treat that is both filling and tasty! 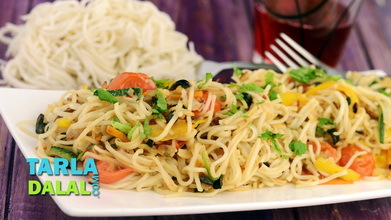 Heat the oil in a deep non-stick kadhai, add 2 cups of hakka noodles and spread it evenly to form a layer and deep-fry till it turns crispy and golden brown in colour from both the sides. Drain on an absorbent paper. Repeat step 1 to deep-fry the remaining noodles. Keep aside. 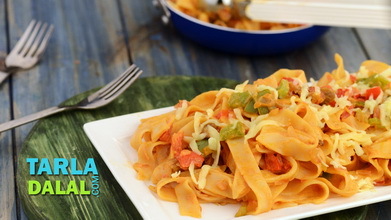 Combine the cornflour with 1½ cups of water in a deep bowl, mix well and keep aside. Heat the oil in a deep non-stick pan, add the onions and sauté on a medium flame for 1 minute. Add the capsicum, carrot and cabbage and sauté on a medium flame for 2 to 3 minutes. 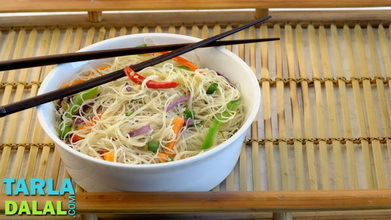 Add the boiled hakka noodles and sauté on a medium flame for 1 minute. 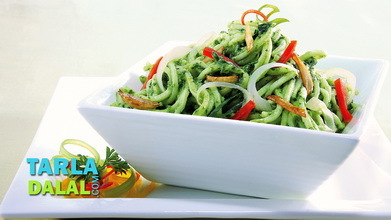 Add the tomato ketchup and chilli sauce, mix well and cook on a medium flame for 1 minute, while stirring occasionally. 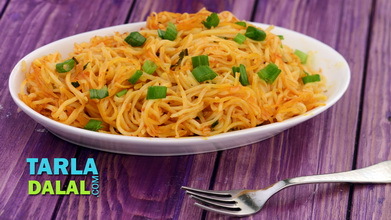 Add the cornflour-water mixture, vinegar, sugar and salt, mix well and cook on a medium flame for 3 to 4 minutes or till the sauce thickens, while stirring occasionally. Divide it into 2 equal portions and keep aside. 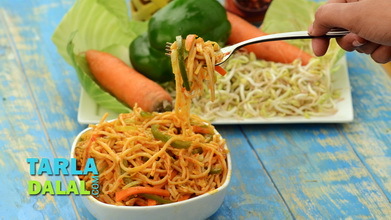 Just before serving, place one portion of the crispy noodles on a serving dish and top it with one portion of the chopsuey evenly over it. Repeat step 1 to make 1 more plate.